More Air Deckers prepare for take-off! 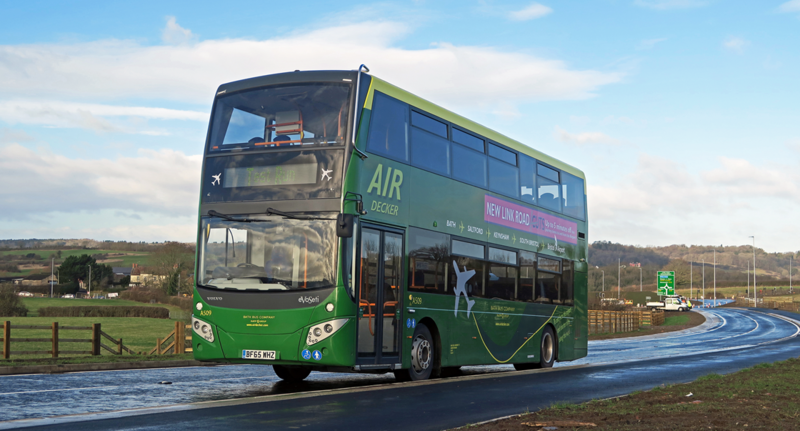 Bath Bus Company is adding more Air Deckers to its bus service from Bath to Bristol Airport from Sunday 29th March 2015. Additional buses are being added to the fleet to operate the A4 Airport service at twice the frequency, running every 30 minutes instead of hourly during the day time. The service also serves Saltford, Keynsham and South Bristol on a route which takes advantage of bus priorities and fast dual carriageways to ensure swift journey times. The new buses – built by Volvo – will incorporate on board audio announcements for bus stops and are equipped with passenger information screens and provision for large luggage items. MD Martin Curtis said, “It is just two years since this service was first introduced when we identified a need for a direct link from Bristol Airport to the World Heritage City of Bath. The public response has been fantastic, much of the credit for which must go to our staff who are constantly praised by passengers for their helpful and welcoming attitude. The service doesn’t follow the course of any other bus route so it doesn’t directly compete with other airport links, and since Bristol Airport itself is growing steadily, we are simply meeting a new demand. In addition to advanced bookings on-line, cash fares can be paid on the bus in either sterling or euros. Closer links to airlines are also currently being discussed with more flights and new destinations being established from Bristol Airport. This entry was posted in Uncategorized on March 26, 2015 by sherlockiscool.